The fact: Ms Eagle’s publicity pictures of the broken window last week had the curtains pulled across. Draw them back and a communal stairwell is revealed [Image: Daily Mail]. There is now no doubt that the window alleged by Angela Eagle to have been broken by a supporter of Jeremy Corbyn in an attempt to “bully” her out of her leadership challenge… actually had nothing to do with her. It is a window casting light onto a shared stairwell in Sherlock House, which houses Ms Eagle’s constituency office along with no less than five other businesses, as the image above shows. Ms Eagle’s office appears to be on the ground floor – with a Labour Party sticker in the window – so it seems unlikely that anybody wishing to target it would have failed to find it. In all fairness, it seems the break was either a random act of vandalism or a failed burglary attempt. But Ms Eagle was determined to blame it on so-called ‘Corbynistas’. Many people – not all of them supporters of Mr Corbyn – are very angry about this bare-faced attempt to hoodwink us. This is one of many lies that have been spread about Mr Corbyn and his supporters by Labour MPs who are trying to remove him from the Labour leadership, after all. And the British public don’t like liars. So what we are left with is the fact that a window pane in a building which houses several businesses, including a constituency office, was broken by person or persons unknown, and for a motive which is not known. What is clear from the evidence is that the window does not give anyone direct access into any of the businesses which share the building, nor has it in any way damaged any of the offices in that building. The picture we were given in the Press and from Ms Eagle was in reality a gross distortion of the facts. So basically you’re now going to try and discredit anyone against Corbyn? Communism is rising I see. I’m going to try to discredit anybody who lies about Mr Corbyn and/or his supporters. That’s a big difference, as I’m sure a person with your understanding of how to distort the facts will acknowledge. If it Was some sort of weird competition this would have been an own goal. She should be charged with deception or at least face some sort of disciplinary action from parliament, she is making it impossible for those who Are genuinely subject to hate crimes to be taken seriously. What sort of lesson, is getting away with outright lies teaching children? and some children do take notice. It’s certainly lowering the Labour Party in the estimation of the general public. Do you not agree that in a democracy politicians found lying should be exposed.? Also, do you not find it alarming that the media have ALL failed to report the truth? How can you say it was one of Mr Corbyns supporters, when nobody knows who did it and why, if its a shared building. from the way it was reported it sounded like it was miss Eagles personal office that was attacked. As far as I can see it’s the other way around. It’s Mr Corbyn who seems to be getting all the attacks not the other two nominees. I think all this anti Corbyn propoganda will seriously backfire on those who are doing it, If they aren’t careful. Before looking at the alleged breaking of a window at Angela Eagles Constituency office let me tell you a little about myself. I lived in Wallasey for 25 years and passed the office most days. My children, grandchildren and great-grandchildren still live in Wallasey and Ms Eagle is their MP. Demographic of the Constituency office. Ms Eagles office is adjacent to the car park for Liscard Shopping Centre. The Royal oak pub is directly opposite and two further pubs to the left and the right are no more than 50-100 yards away. It is an area known for trouble and vandalism and this can be checked by FOI. Ms Eagles office is contained within a building with 4-5 other businesses in situ. When I lived in Wallasey (I left in 2008) there were many incidents of shop windows being broken and many of incidents of wing mirrors being kicked off or body work scratched and car badges taken. My home was broken into and invaded on two separate occasions. It is a poor area with a high incidence of drug use. I therefore found it strange that Ms Eagle, Jane Kennedy (Merseyside Police Commissioner and the whole of the press immediately ‘knew’ the broken glass at Sherlock House was firstly an attack on Ms Eagle, and secondly it had been carried out by a Corbyn Supporter. There are many variables as to why the window had been broken, vandalism, drunkenness or dissatisfaction with one on the four occupants occupying the premises. However we were told almost immediately the broken window was a Corbyn supporter. Jane Kennedy went so far as to call it a ‘cowardly act’ and informs she will dispatch personal to protect the premises. As a former resident of Wallasey who endured burglaries, and vandalism a number of times I find Ms Kennedy’s sycophant behaviour inexcusable and left me very angry. Where was her voice speaking out for me and countless other real victims in Wallasey? The media have been complicit in this ridiculous story of the ‘Curious case of the Broken Window’; lazy downright shabby reporting by media establishments that should know better. In November 2015 the Liscard Christmas tree was vandalised; the tree no more than 50-100 metres away from Eagles office. Did Jeremy Corbyn’s Supporters vandalise the tree? Rake Lane Cemetery 150 metres from Eagles office vandalised, again did Corbyn Supporters have a hand in that? It now transpires it was a window in the shared stairwell and not Miss Eagles office at all.It’s all been a concocted fairy story given credibility by a lazy media. An excellent post! I am sick of hearing that anything that goes wrong in the world is the fault of Corbyn allies. I suppose it’s also their fault about Turkey! In fact I have seen Facebook posts blaming Turkey on Brexit! It’s just ridiculous. You see, I wonder about all these stories of intimidation by JC supporters – we know he is going to win, so why would we bother? I mean it’s not like Eagle or Smith are real threats is it? Seems a tad unlikely we’d be running around breaking windows and hurling abuse when we have already won the debate. It’s not a tad unlikely at all. There will be some JC supporters who ARE throwing abuse on social media etc, in order to try and protect JC as much as possible. Unfortunately, what those people don’t realise (either through plain stupidity or lack of brains) is, that by doing what they’re doing, they don’t help either the Labour Party or Corbyn (or both). Although I should stress that Corbyn has repeatedly ‘disassociated’ himself from those people. Oh, and when you say “we know”…. YOU might, but NOT everyone else might! Semi-related: a recent article in the Mirror attempted to attribute abuse and threats sent to Luciana Berger to Corbyn’s supporters, despite the fact that someone had already been arrested for making them – a far-RIGHT serial offender known to Berger. I guess we’ll find out soon enough, but it’s possible that that window where the Labour poster is, ISN’T actually her constituency office? They might have removed anything identifiable like that, in order to try and avoid any trouble? Certainly. 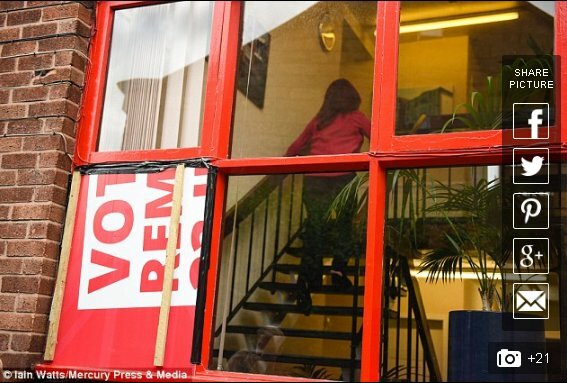 One thing’s for sure, though – the broken window definitely wasn’t part of the constituency office. True. I was just throwing another possibility into the mix that’s all. The window with the poster is her office if memory serves. I used to be a constituent. im sure she could win a genral election if the all the other parties were kept off the ballot. This will be the moment Ms Eagle Exits Stage Right and allows another Lying Numpty as sole challenger to Mr Corbyn, I cannot understand why any Working Class this includes the Deluded so called Middle Class get it into your thick heads you get up in the morning and go to a place where you Slave, and if you think wearing a collar and tie makes you a superior being to someone who wears overalls think again because we detest your inverted Snobbery and the so called Upper Class laugh at and Humiliate Your Kind, you are exactly the same as we the real Grafters S**te on the sole of the Rich and Uber Rich Shoe,sorry I digress anyway Mr Smith if he has any sense of Decency will withdraw his Blairite Loving self and Resign from the Labour Movement, this being a Movement He has no affiliation to as his Party is DEAD this request applies to the 174 NUMPTIES who have attempted to destroy The Workers Movement “RESIGN ALL OF YOU” your pathetic attempt to Kill Democracy is Doomed to Failure. And, of course, the nice touch of temporarily repairing the window with part of a “Vote Remain” placard – facing outwards naturally! Yes, I too noticed that. Dr Goebbels would have been most impressed by such a stunt. Note, too, that early TV coverage showed that the broken glass from the window was located OUTSIDE the window on the ground underneath where the window had been. Why – it is almost suggestive of being an inside job – literally! So many strange little facts around this situation – like what happened to the brick and whether or not it has been checked for Jeremy Corbyn’s fingerprints? – seem to have been let unaddressed. Why is that? Jane Kennedy of course is a veteran Blairite who got put in as an MP as a reward for her services, including allegations of violence, against the left. I fail to understand how a woman who is meant to be in a responsible position could make such an accusation especially in light of no proof whatsoever. She seems like a power hungry, blatent opportunist to me. Emulating the tories methods of getting what they want at all costs does not enamour her in the light of the electorate. Her whole aggressive approach to the leadershop is what is totally out of kilter with Labour politics, not Jeremy Corbyn! If the party reputation was her motivation she could have approacjed the media in a whole different way. I do not trust her. I’ve heard from a few local sources that the window may have been damaged during a fight that took place near the pub. Her office is near the Royal Oak where I’ve had a beer or two in my time. I’m guessing whoever put the window through isn’t that bright anyway if it’s supposed to be political comment, so the fact that they missed the right window could be explained by stupidity. Or it’s just coincidence. I tend to the idiot school of thought. I’m told the window was broken from the inside, which tends to support your “stupidity” hypothesis. I’ve seen the rumour that it was broken from the inside circulating quite a bit, but I can find no evidence at all that it was. (No, there is no photo I can find that shows broken glass on the ground outside.) The nearest I can find is someone on a forum CLAIMING that there is evidence the window was broken from the inside, but then linking to a Twitter feed of a local journalist who has shared photos of the broken window, including one photo ***taken from inside the building*** i.e. the photographer was inside the building, not the person who broke the window. I suspect it’s Chinese Whispers therefore. Could be! I did qualify my remark by saying I’d been told it was broken from the inside but it wasn’t very well-written so I’ve edited it. We had to put up with this sort of thing in Scotland during the independence referendum – every time someone got a scratch on their car it was blamed on “intimidatory yes campaigners”. It’s an old smear, but the extent to which the media run with it is shocking. As someone already said in a comment above, why on earth would Corbyn supporters resort too violence? What possible positive effect could that have? The fact that Ms Eagle maintained the brick was throw by a Corbyn supporter suggests that either she or someone connected with her SAW the person in question (no doubt wearing an ‘I support Jeremy Corbyn’ T-shirt) or that she was able to establish from contac with the person in question that he/she was a Corbyn emissary. Very doubtful. “Angela Eagle lied” – can you please point me towards any reputable link that quotes Angela Eagle attaching the smashed window to anyone associated with Jeremy Corbyn? Depends what you call reputable, really, doesn’t it? The question here is, who can we trust in the Parliamentary Labour Party? I’d start by ruling out anybody who voted ‘no confidence’ in Jeremy Corbyn in the last week of June. You pathetic Trotskyite apologists – we know what Corbyn and his thugs are capable of – we don’t need biased reporting to distort the truth. You won’t mind me reporting your abusive comment to the Labour Party, then – to show what anti-Corbyn activists are doing. Strange that it was actually Jeremy Corbyn that said it was an attack on Angela Eagle. Strange that you would suggest such a thing. Eagle said it first. Corbyn was reacting to the information he had received – after Eagle reported that the window had been broken. Wonder if or when we will see a printed retraction in press or on the news. Won’t be holding my breath! Unless, of course, they did it themselves. Heard that she stated there was a bomb threat or terrorist threat attack planned at a hotel she was going to a meeting at……but hotel denied said they cancelled because they didn’t want her there! Walked by Angela’s on said day! Saw loads of reporters what a photo opp!!!! Didn’t see any police until a hour or a hour and half later ( two cops present then! while man fixed the window). To bad reporter s did have a good look at Wallasey!!! Have you seen some of the before and after photos of places UK has bombed!!! Before photo s look a lot better than Wallasey!!! The way she votes looks like she’d prefer her constituent s to be canon fodder!!!???? 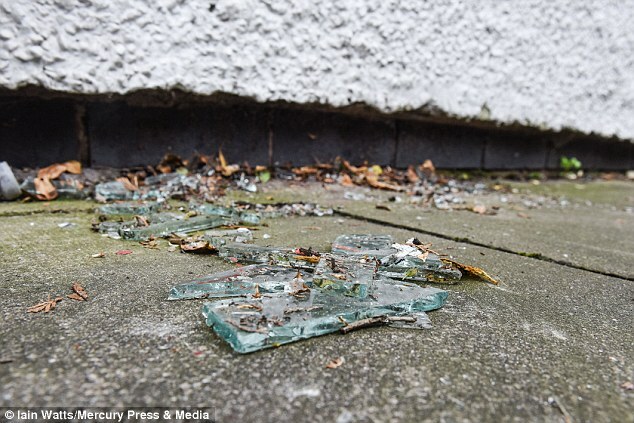 There is a picture in a Daily Mail article http://www.dailymail.co.uk/news/article-3686082/Hours-challenging-Jeremy-Corbyn-Labour-leadership-Angela-Eagle-s-office-BRICKED-Labour-civil-war-turns-nasty.html which shows the glass on the ground outside the window [ http://i.dailymail.co.uk/i/pix/2016/07/12/12/363184A200000578-3686082-image-a-50_1468323365332.jpg ] and another picture of the inside of the building showing no broken glass. I would hardly describe the Daily Mail as a stooge of Jeremy Corbyn or Labour so the fact that these pictures occur in one of their articles must be taken as objective evidence of the truth that the window was broken from the inside. Check the pictures for yourself.